Sylvia Plath, one of the most important poets of the 20th century, was born in Massachusetts in 1932. She began publishing poetry at an early age and attended Smith College, where she wrote 400 poems during her time there. After winning a short story contest sponsored by Mademoiselle, she was offered an internship at the magazine in New York City. That summer, Plath’s depressive tendencies peaked with a failed suicide attempt and a series of traumatic electroshock treatments. 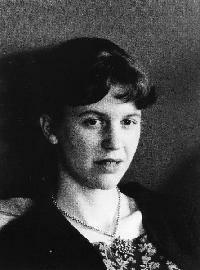 After her graduation, Plath won a Fulbright Award to study at Cambridge University. There she met the poet Ted Hughes whom she married in 1956. Their infamously volatile relationship produced two children and a stunning amount of work, but ultimately ended in 1962. That year, Plath wrote her definitive poetry collection, Ariel. Plath committed suicide in 1963, leaving behind a tragic and tremendous literary legacy.